Trago Mechanical, Inc. was created in 1999 when Anthony D. Trago (Tony) left his former employment as a service technician. Tony formed his company in the basement of the home he shared with his wife Jaryn and their two children. He, along with 2 other techs ran the service calls, while Jaryn did all of the office work in between the many jobs of being wife and mother. Together they became Trago Mechanical, Inc. They soon outgrew their basement/dining room office and in 2002 they rented an historic train station on Millwood Road in West Willow, PA. They hired a few more technicians and an assistant for the office. The business was growing rapidly and Tony had to keep hiring technicians to keep up with the demand for the quality work Trago Mechanical, Inc. provided. By 2006, Trago Mechanical, Inc. was getting too large for the old train station. Tony and Jaryn form a company called Hyhorse Properties and purchased the Herr’s Cleaners building in Willow Street, PA. Keeping the laundry-mat side of the building, Hyhorse renovated the dry-cleaning side, transforming it into the current site of Trago Mechanical, Inc. The company continues to grow and prosper not through advertisement, but through the reputation of our family of installation and service technicians. The company motto “When Experience Counts” means nothing less than knowledgeable, clean, neatly uniformed technicians doing their job well and being courteous and considerate of our customers. 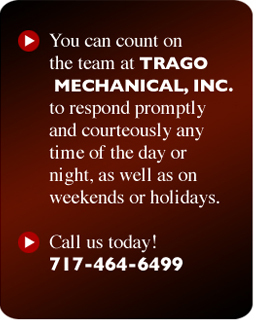 That kind of work attitude goes a long way in bringing new customers to Trago Mechanical, Inc., as well as keeping the customers we have successfully served over the years. We look forward to providing quality Commercial HVAC-R installation and service for many years to come.